Our innovative House System is a hallmark program for Bishop Hartley High School. The creation of the program began seven years ago when a team of Hartley administrators, faculty and staff led the charge to create an environment where every student felt at home. They wanted to ensure all students had a support system, healthy peer relationships, people to turn to with questions, great adult role models, and a place to be themselves. That effort led to the creation of Bishop Hartley’s House System. Every house contains members of the faculty and staff to mentor and provide pastoral care to all our students. In each of the six houses, there are approximately 120 students. Split into six mentor groups (five students from each grade for a total of 20 students per mentor group), students meet with their mentor teacher/group every day. The primary purposes of the House System are to further the mission of the school by providing greater pastoral care to all our students, training and guiding our students to become leaders and strengthening our sense of community. Each student is assigned to one of six houses. Our House System assures that each student is embraced in the “Hartley Family Spirit” while recognizing them for their individual gifts and talents. Our program enables us to strengthen the partnership of school, student, and parent in the development of each child that walks through the doors of Bishop Hartley. No matter what house a student belongs, we are all Hawks committed to furthering the mission of Christ both in our community and in the world. At Hartley, we believe it is imperative for students to gain not only knowledge in high school but also real world skills to be successful. We expect students to use their education and make an impact. One of the most critical skills is leadership. With the House System’s focus on developing leaders, the House Program was expanded in 2014 to include a unique leadership curriculum. 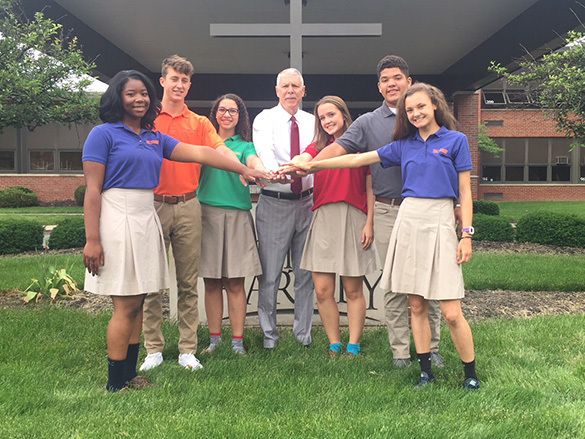 Bishop Hartley is the only school in the Dioceses to offer an approved leadership curriculum for which students earn graduation credit. Congratulations to the newly selected students who will be part of House Leadership for the 2017-18 school year! While integrating many of the roles of our previous student government system, the House System provides more leadership positions than that of a traditional student council model. Students can serve in more than 100 school leadership positions, including: School Captains, School Vice-Captains, Senior House Captain, Junior House Captain, Sophomore House Captain, Freshman House Captain, House Chaplain, and House Service Coordinator. The House System provides a framework for activities and programs which embrace Hartley’s Six Pillars including the development of leadership skills. While there are many opportunities for leadership, one of the primary goals of the House System is to enable all students, not just those who hold a specific title, to embrace their potential for leadership to prepare them to make positive changes in our community. One opportunity students have to make this impact is through the Bishop Hartley Service Hour Requirement. Each student is required to complete 25 hours of service annually. Students keep track of their progress and develop a service portfolio that will be a working document throughout their four years at Hartley. The recent addition of an approved leadership curriculum, for which the students earn graduation credit, provides the knowledge and skills necessary for effective mentoring, intentional leadership, character development, and service to others. Our House system provides a forum in which students both learn and apply their leadership skills. Five House Days are held throughout the year to give students an extended period of time to further the mission of the House System. These days include opportunities to earn points in the year long competition to win the House Cup. As friendly rivalries emerge, houses will compete in the areas of academics, athletics, school spirit, and more with the culmination of the competition during the House Olympics in the spring. Reminder: Parents can check the amount of hours their son and/or daughter has verified through their ALMA account through their mentor group leadership course. Students should check the service boards in the cafeteria for service opportunities or check with their House Service Coordinator(s). The service boards are updated daily. There is a Garden Party at Christ the King Church just down the street from Hartley every Wednesday immediately after school. See Mr. Triplett for details. The House Parent Organization (HPO) is a critical component of the House System. The mission of the HPO is to foster parent participation through communication and a sense of belonging while advancing the spirit of the six pillars that are the foundation of Bishop Hartley High School. Just as every student is in the House System, every parent is a member of the House Parent Organization. The HPO, Similar in some ways to a home and school associations but more dynamic than the traditional parent group, the HPO provides parents with any opportunity to be an active member of the Hartley Family. Parents provide adult leadership and volunteer support for the numerous events and activities sponsored by the HPO.